Designation: Key Laboratory of Exploration Technologies for Oil and Gas Resources, Ministry of Education, Yangtze University, School of Geosciences. 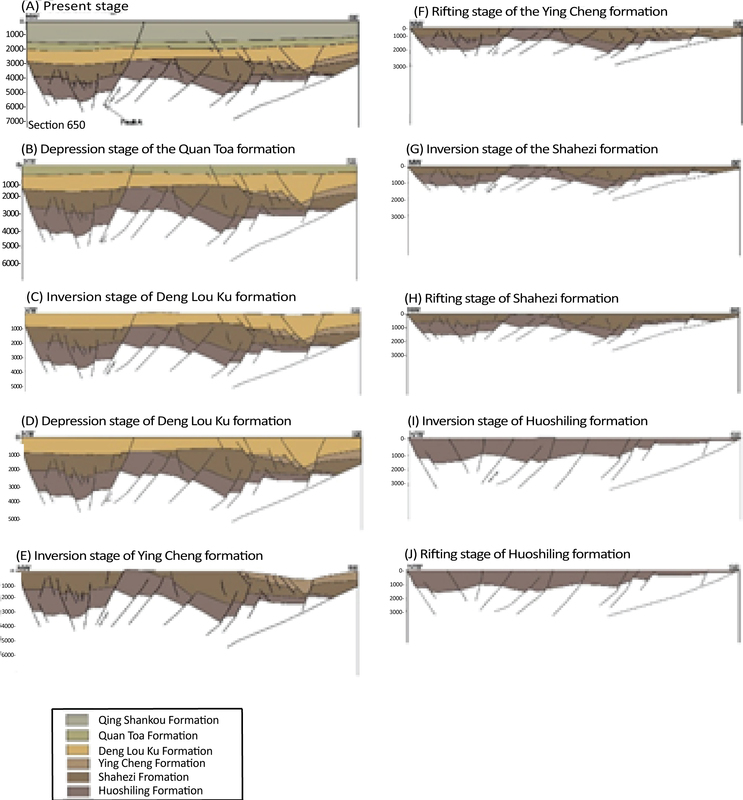 List of Author(s): Ben-kane G, Wangshui H, Meng H, Xiantao G.
Citation: Ben-kane G, Wangshui H, Meng H, Xiantao G (2018) Geometric Evolution of Inverted Structures within the Dehui Depression, Songliao Basin, North East China. Sch J Appl Sci Res. Vol: 1, Issu: 7 (09-16). Copyright: © 2018 Ben-kane G. This is an open-access article distributed under the terms of the Creative Commons Attribution License, which permits unrestricted use, distribution, and reproduction in any medium, provided the original author and source are credited. In this study, cross section balancing and restoration of 2D seismic reflections acquired from the Dehui depression is utilized in defining the structural evolution of the identified stratigraphic units and to further detail out the inverted structures which had occurred as a result of fault reactivated inversion. Inversion which occurred in the Late Cretaceous had led to a region-wide extension and compression with re-occurring reactivation of pre-existing normal faults resulting in the formation of complex inverted structures. The evolution of the pre-existing normal faults had a significant controlling influence on the deposition of sediments which defined the depressions architecture, such that it had led to the formation of half-grabens. Reactivation of pre-existing normal faults had resulted in the inversion style being depicted as a moderate inversion. Displacement along the reactivated pre-existing normal faults had also led to shortening within the syn-rift succession sequence, resulting in the structural deformation being largely accommodated by asymmetrical fault-related folds. Dehui depression, Fault-related folds, Pre-existing normal faults, Reactivation, Shortening. Inverted structures have long been identified to be of utmost importance in establishing the structural evolution of sedimentary strata, such that they detail out the extent of structural deformation and transposition of rift-related strata which best serves as favorable structures for the trapping of hydrocarbon deposits. From different geological locations, inverted structures have been recognized by various authors [1-5], which were quite distinctive of complex intra-continental basins [6-7]. Inverted structures have also been noted to exist in several basins of eastern China and the continental shelf of the South China Sea . Although, the generally assertion is that inversion tectonic processes are often assumed to be as a result of simple fault reactivation, numerous studies have shown that inverted structures may depict geometries of complex nature due to pre-existing normal faults being either truncated or reactivated as younger faults [9-12]. Due to lateral stratigraphic variations formed as a result of displacement within normal faults, additional complex structuralgeological settings must be taken into consideration during the process of restoration of previously faulted continental margins . Through the use of balanced and restored cross sections which has been widely acknowledged by oil and gas industries as a means of systematic exploration programs [14-20], along with improved reconstructed geometric structural models of faulted terrains, would aid in providing enhanced insight into terrains of expected rock fracturing or fabric formation that may compartmentalize subsurface fluid flows of importance to resource recovery . The focus of this study is the Dehui depression which is best described as a complex sub-tectonic unit of the Songliao Basin (Figure 1 and 2) [22-27] with rift-related successions of strata which occurred as a result of late Mesozoic rifting and lithospheric thinning . The rifted succession of the Dehui depression has thus so far exhibited high prospectiveness in the accumulation of hydrocarbon [29,30] and has yielded voluminous quantities of oil and gas owing to the architecture of its complex inverted structures. Episodic inversion had to some extent displaced and complicated the co-relating stratigraphic units within the depression. Tectonic sketch map of Asia Continent [22-26]. 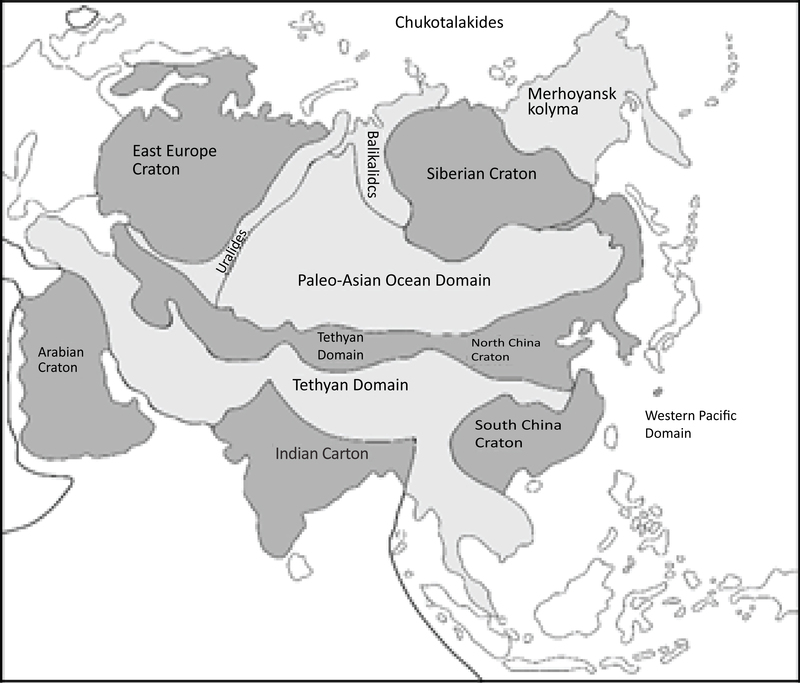 Figure 1: Tectonic sketch map of Asia Continent [22-26]. Tectonic map of northeast China and adjacent regions . 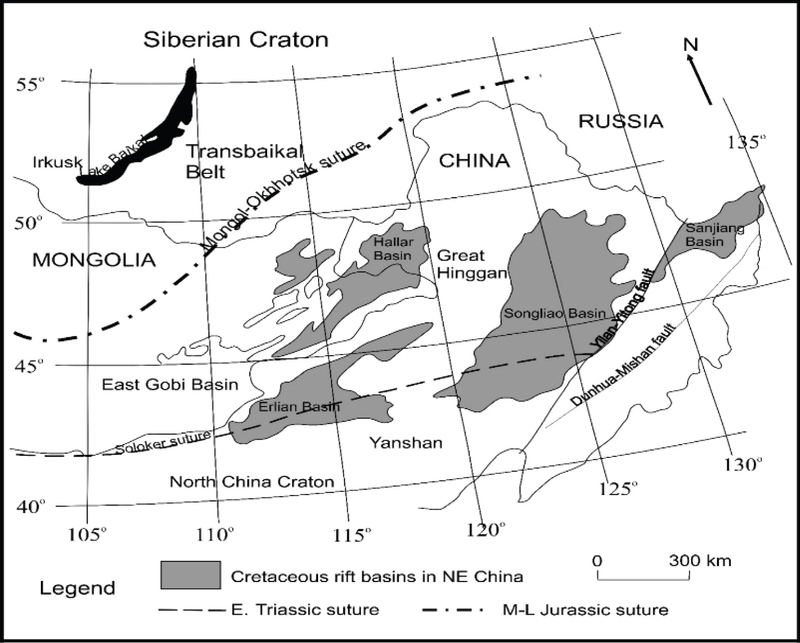 Figure 2: Tectonic map of northeast China and adjacent regions . In this study, the use of balanced and restored cross sections from recently acquired 2D seismic data will aid in defining the inversion tectonic evolution and analyze the geometry of inverted structures within the study area. Cross-section balancing has been accepted as a conceptual approach to aid the better understanding of deformed terrains based on adding further common sense rules in the absence of detailed observations . The use of balanced cross-sections has thus provided further insight to complex orogenic problems amongst recent authors have consistently reiterated that improved structural and geomechanical modelling enriches the geological understanding to improve seismic interpretations [31-34]. Especially as it is effective in complex terrains where images are poorly reflected . The construction of a balanced cross section through the use of a modeling software can be achieved by the use of simple primitives and interpolation-extrapolation techniques which are employed in the reconstruction of the subsurface eroded parts of structures . Based on the kinematic algorithm of the software being used, the following assumptions are to be considered in the restoration of the cross sections. The horizon length of each bed running parallel to the reference surface should be preserved and the cross sectional area should remain unchanged. The initial geometry of each fault should remain unaltered throughout the process of deformation. 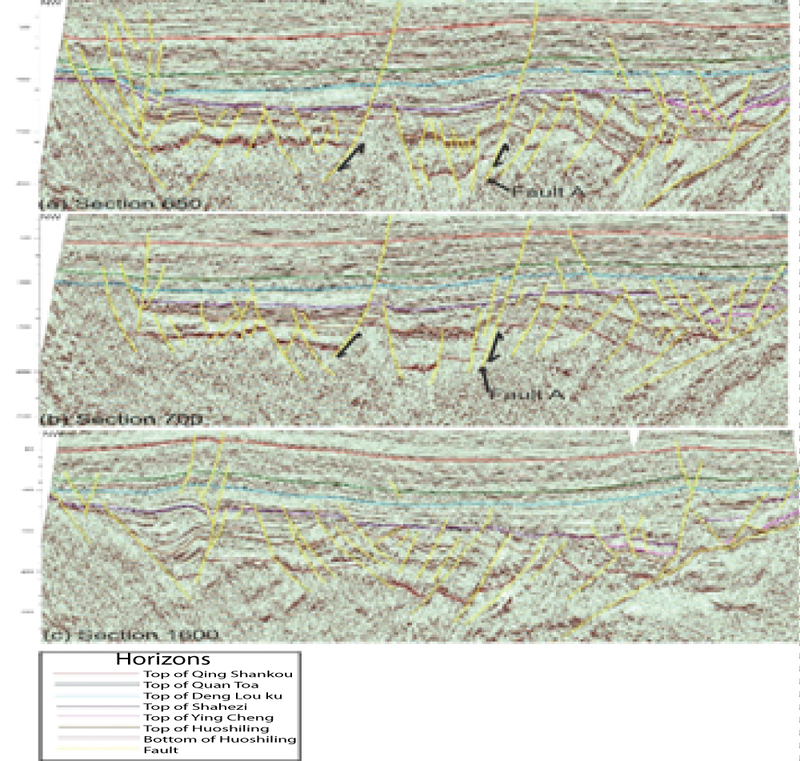 The 2D seismic data with the direction of NW – SE were obtained by Jilin oilfield branch of PetroChina Co. Ltd. By means of seismic interpretation and well log data, the various sequential stratigraphic units and the structural characteristics were outlined. Time domain sections were converted into depth (meters) for each identified stratigraphic units based on extracted log data for which Time-Depth conversion graphs and equations (Figure 3) were produced for each seismic profile. 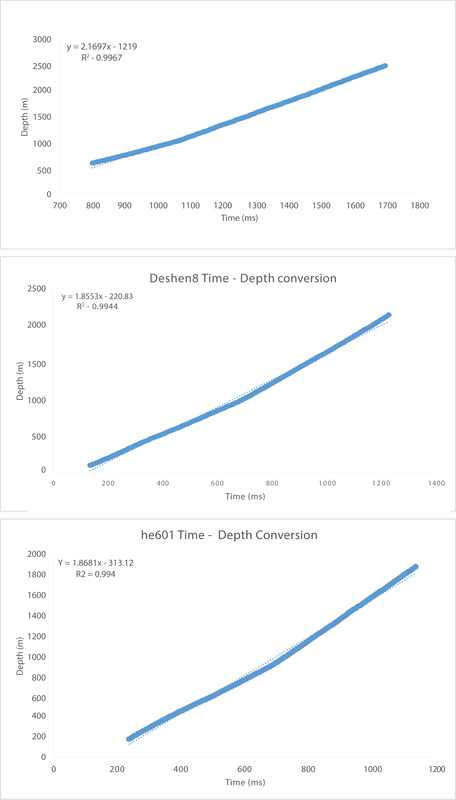 Representation of Time –Depth conversion graphs. Figure 3: Representation of Time –Depth conversion graphs. 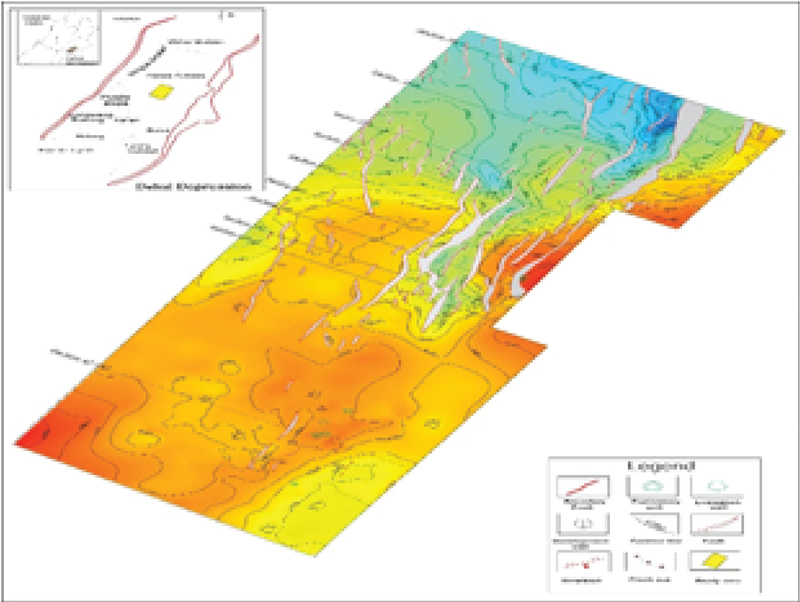 Ten depth-converted Northwest-Southeast oriented geological cross sections were sequentially balanced and restored by unfaulting and unfolding with the aid of 2D Move structural modeling software. In order to attain a balanced 2D cross section, the cross sections were constructed parallel to the tectonic transport direction, of which both are perpendicular to the strike of the main geological structures. The restorations were reconstructed in accordance to the reverse geomorphological growth sequence to obtain the pre-deformational geometry of the syn-rift stratigraphic formation and to suggest the kinematic evolution of the major faults. The geometry and kinematic characteristic of the major faults and syn-rift stratigraphic units were measured and interpreted by means of fault inversion ratio and horizontal inversion ratio respectively. The fault inversion ratio is represented as the ratio of contractional to extensional displacement along a fault . The horizontal inversion ratio represents the relative contractional versus extensional deformation. The horizontal inversion ratio represents the inversion degree of inverted structures or regions without any reactivated fault or with one or more reactivated faults and folding of the sedimentary sequences . Taking into consideration inversion structures experiencing the same geological conditions, the more shortening a structure accommodates during inversion movements, the higher the horizontal inversion ratio, as well as the fault inversion ratio, provided the displacement within the fault accommodates the effect of shortening . Shortening of the bed lengths was determined by comparing the balanced profile to the restored profile of each stratigraphic unit. Subsequent to the restoration of each stratigraphic unit, the entire section was restored by removing fault offset and unfolding in order to obtain a restored horizon. Decompaction and restoration of unconformity were not considered in the restoration process, though both were perceived to be vital in achieving some amount of certainty in the reconstructed structures especially in areas with significant variation in the thickness of the deformed strata (Figure 4). Stack image of the study area. Figure 4: Stack image of the study area. The Dehui Depression is located in the southeastern uplifted region of the Songliao Basin (Figure 5), covering an estimated area of 4,053 km2, and is identified as a subtectonic unit . The Dehui depression is characterized by a relatively high abundance of normal and transfer faults, and fault-related folds. Isopach map illustrating the tectonic location, structural units, internal units within the study area and geographic location of the Dehui depression. Figure 5: Isopach map illustrating the tectonic location, structural units, internal units within the study area and geographic location of the Dehui depression. The Songliao basin being of the form of an extensional basin would normally depict an evolutionary transition process of form, expand, shrink and disappear [39-41]. This can be inferred from the fact that the Songliao Basin was formed as a result of extensions along the margins due to relative movement through the subduction of the Pacific Plate which resulted in rifting, uplift and erosion, subsidence, and finally inversion . Recent developments in respect of the Songliao basin’s architecture confirm the structural style as having gone through a polyphase evolution where rifting played a vital role  in its transitioning state, and thus subsequently resulting in the geological setting of the Songliao basin being that of a double – sided active continental margin located between the two orogenic belts: Mongol – Okhotsk and the Sikhote – Alin orogenic belts . The Songliao Basin had subsequently been acted on by tectonic forces which most importantly resulted in episodic tectonic inversion owing to alterations in the intra continental stress regime. The Songliao Basin has been determined to be resting upon a Detachment fault system [42-44]. This is evidenced by the profound rift structures, thinned crust and the largescale cretaceous volcanism which gives a strong indication that the region had undergone a significant amount of extension. Distinct metamorphic core complexes within and around the basin which gives further indication of the occurrence of a Cretaceous detachment faulting system [45- 47]. The Dehui depression is bounded by two major faults, Dexi fault and Dedong fault located to the west and to the east respectively. The basin structure of the Dehui depression was affected by the variations in these boundary faults evolution . Due to episodic tectonic activity on the Dehui depression, fault activity had led to the formation of graben structures and control on the sedimentation process of the sequential formations . The complex nature of the depression is depicted by the inverted structures which have thus provided favorable structural traps for the preservation of the hydrocarbon deposits. The inverted structures formed within the extensional basin had occurred due to the reactivation of thrust faults resulting from weak segments of the supporting lithosphere being subjected to compression . Major controlling fault systems had occurred through multiple reactivation in the form of ductile shear, extension, strike slip and compression [50,51]. Also associated with the major faults were antithetic and synthetic faults within the Huoshiling Formation. Based on the collated seismic sections (Figure 6), the poorly reflected basement comprises of Precambrian and Paleozoic igneous and metamorphic rocks which is observed to be overlain uncomfortably by Mesozoic and Cenozoic sedimentary rock sequences, with the entire basin being comprised of Jurassic, Cretaceous and Cenozoic rocks . Interpretation of the seismic sections revealed that the identified stratigraphic horizon formations within the Dehui depression is divided into stages; pre-rift stage which consists of the Paleozoic, the syn-rift stage consisting of the Ying Cheng, Shahezi, and Huoshiling Formations and the post-rift stage consisting of the Qing Shankou, Quan Toa, Deng Lou Ku Formations, (Figure 7) [44,52-55]. Two-way Time Section of North West oriented seismic profiles depicting structures within the Dehui depression (a) Section 650 and (b) Section 700 showing reactivation of Fault A (c) Section 1600 detailing faultrelated folds. Figure 6: Two-way Time Section of North West oriented seismic profiles depicting structures within the Dehui depression (a) Section 650 and (b) Section 700 showing reactivation of Fault A (c) Section 1600 detailing faultrelated folds. Schematic stratigraphic units within the study area [44,52-55]. Figure 7: Schematic stratigraphic units within the study area [44,52-55]. The Early syn-rift stage - Huoshiling Formation, the Rift-climax stage – Shahezi Formation, and the Late syn-rift stage – Ying Cheng Formation, all of which makes up the rift-related succession , and the Post rift stage which is characterized by the Rift depression transition stage – Deng Lou Ku Formation overlain by the other non-rift related successive formations, the Quan Toa and Qing Shankou Formations (Figure 7) . The succession of sedimentary rocks from the Huoshiling Formation to the Ying Cheng Formation had been deformed extensively through rifting, uplifting, erosion, sagging and eventually structural inversion which led to the elevation of hanging walls and the creation of fault-related fold structures (Figure 6c). The Huoshiling Formation consists predominantly of volcanic flows and pyroclastic rocks with an intercalation of clastic fluvial rocks. The Shahezi Formation consists of siltstone, mudstone and intercalation of fine sandstone suggesting a transition from a fluvial controlled environment to a lacustrine controlled environment. The Ying cheng Formation consists of siltstone, mudstone with interstratified layers of medium to fine sandstone. The Deng Lou Ku Formation – Rift-depression stage depicts a period of quiescence and stability by which is characterized by minor tectonic activity and regional subsidence. The Deng Lou ku Formation which had endured a less intense deformation, which can be deduced as the time period at which inversion was likely to have ceased, though faulting continued but at a lesser extent which have been estimated to have occurred within the Late Cretaceous to Early Cenozoic. The deposition of sediments by fluviatile and lacustrine means of transportation resulting in the overlaid sediments caused a significant amount of sag in the depression. In addition to this, recent studies suggest that the collapsing of large mafic magma chambers beneath the continental crust contributed significantly to the sagging event . Both Quan Toa and Qing Shankou formations are almost flat-lying and do not depict significant amount of variation in thickness in their beds. Thickness increase in the post rift sedimentary strata indicates loading and flexural bending had caused a region wide subsidence. Kinematic motion along pre-existing normal faults and newly formed reactivated normal faults had contributing effects to the subsidence in the depression. The inverted structures within the Dehui depression were created by the tectonic movement emanating from the subduction of the Pacific plate. The subduction of the Pacific plate directed towards North East Asia resulted in the entire Songliao basin being uplifted and subsequently led to the formation of several positive inversion structures . The structural style within the Dehui depression is characterized by half-graben structures dissected by reactivated pre-existing normal faults and foldaccommodation faults. The sequential reverse restoration of cross-section 650 (Figure 8) depicts the structural inversion evolution involving a pre-existing normal fault. The relative movement of the hanging wall to the foot wall along the growth fault is quite characteristically noticeable. Restoration of the Quan Toa Formation and Deng Lou Ku Formations (Figure 8) reveals that Fault A had been significantly reactivated due to the transition from the occurrence of inversion to depression during the deposition of the two formations. The transformation of the fault supports the generally accepted observation which suggests that structural inversion had mostly occurred within the Late Cretaceous (100.5 – 66 M.y.). Restoration of the underlying syn-rift units revealed insignificant transformation with mild inversion. The reactivated pre-existing normal fault had endured four phases of inversion with mild fault movement resulting in compressional shortening which were largely accommodated by wide gentle limbs of fault-related folds. Calculated fault inversion ratios for the reactivated major fault in section 650 (Figure 6a) and section 700 (Figure 6b) were 0.29 and 0.31 respectively which is indicative of a mild to moderate inversion. Sequential restoration of section 650 depicting inversion movement along Fault A. Figure 8: Sequential restoration of section 650 depicting inversion movement along Fault A. Associated with inversion-related deformation are anticline-syncline pairs of which are more prominent within the syn-rift unit. Both syn-rift and the overlying post-rift units had endured different phases of compression (Figure 8), resulting in the successive unit being shortened as a result of uplifting and folding along the reactivated pre-existing normal faults. The axial plane of the anticline is oriented almost parallel to the reactivated extensional major faults whilst its geometry depicted is asymmetrical in nature. The geometry of the syn-rift succession suggests that a pervasive and severe uplifting event had occurred within the Early Cretaceous (145-100.5 M.y.) had a major influence on the entire down-faulted depression, subsequently followed by severe erosion resulting in the Ying cheng strata depicting a pinch-out geometry overlying an uplifted area to the North-eastern region of the study area (Figure 4 and 5). The geometry of the folds in section 1600 (Figure 6c) depicts that of a Reverse-drag fold, as it shows significant variation in amplitude of the hanging-wall reverse-drag anticline being greater than the amplitude of the foot-wall reversedrag syncline . The Dehui depression is characterized by complex inverted structures featuring reactivated pre-existing normal faults and fault-related folds. Interpretation of the geometry of the folded structures suggests that a severe and pervasive uplift had occurred subsequently followed by a major unconformity specifically affecting the syn-rift succession prior to the fault-reactivated inversion which has been noted to be the most common structural style within the region . The folds possessed gently dipping limbs geometrically asymmetrical to each other, thus supporting the premise that assumes that the faults had largely accommodated the shortening displacements due to inversion. Restoration of the balanced cross-section reveals at least 4 (four) phases of compressional-extensional movements. It had occurred with reference to inversion due to the tectonic stress regime originating from the subduction of the pacific plate. The observation emphasizes the fact that the depression had endured probably multiple phases of inversion tectonic mostly occurring within the Late Cretaceous, which is evidenced by kinematic movements along the reactivated pre-existing major normal faults which had been mild to moderately inverted. Displacement along the major faults parallel to the direction of tectonic transport played a vital role in the structural style of the deformed structures been depicted as half-grabens which are indicative of the control over the style of deposition of the sediments with respect to the synrift successive sequence. Lateral stratigraphic variation in thickness within the syn-rift unit suggests that the activity of inversion tectonic had a pervasive effect on the displacement of the unit. Shortening values obtained by comparing balanced cross sections to restored cross sections ranged from 1.32% to 5.98% (Table 1). The small range of values are indicative of the absence of back thrust or shortcut thrusting in the study area. Due to the small range in magnitude of shortening, development of thrusts is deemed unfavorably . The absence of thrust is also indicative of the fact that the limbs of the asymmetric folds had widely accommodated the effect of shortening. Computed fault inversion ratio of fault A as illustrated in section 650 and section 700 (Figure 6a and 6b) was obtained as 0.29 and 0.31 respectively. This is indicative of the presence of moderate inversion, which is in agreement with the noted most common pattern of inversion structures within the Songliao basin . 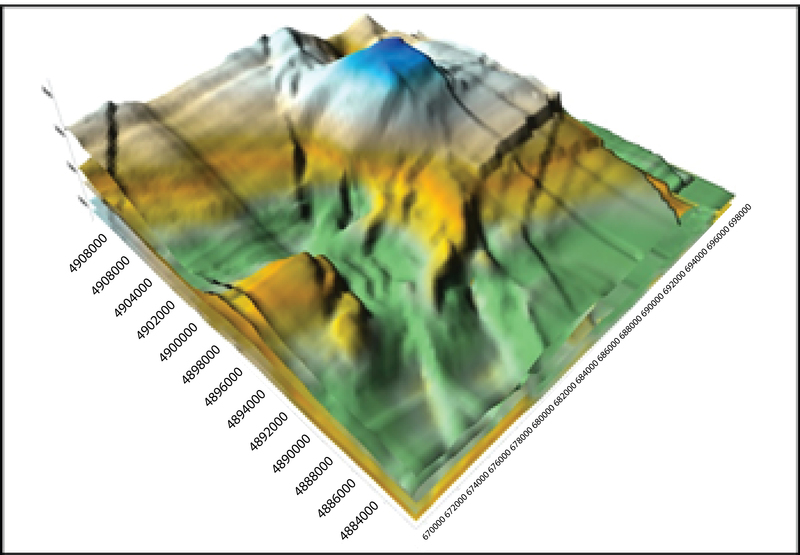 Computed Horizontal inversion ratio values obtained for the Huoshiling Formation reveals the complexity in the deformation within the terrain. Section 700 (Figure 6b) had a horizontal inversion ratio of 6.12. Shortening was obtained to be high within the middle section of the study area (Figure 5). This was as a response to the complex structural deformation being accommodated by the folds and also due to significant displacement within the stratigraphic unit as the major faults had endured multiple inversion movement. In restoring the cross-sections, the shortening in the synrift unit ranged from 1.32% to 5.98% (Table 1). This is in agreement with the documented observation of tectonic activity with regards to the Songliao basin of which inversion complexity was predominantly afflicted in the east and decreased significantly towards the west . The pinch-out geometry of the Ying Cheng Formation and the variation in thickness of both Shahezi and Huoshiling formations within the study area suggests that with the accumulation of synrift growth strata, inversion tectonic had played a significant role in the lateral displacement of the stratigraphic units. 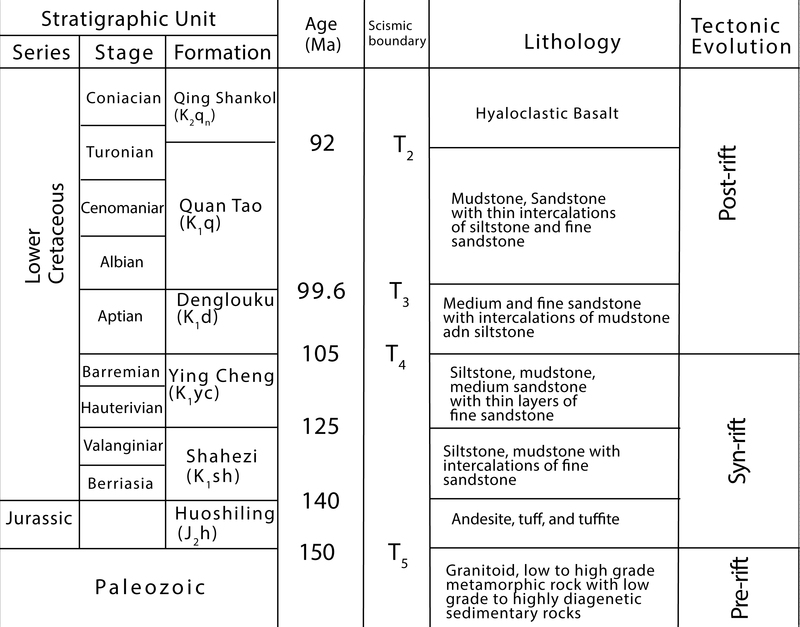 Table 1: Shortening (in meters and percentage) in the Huoshiling Formation. The Dehui depression is characterized by partially inverted half-grabens oriented in the North-west direction and of which its syn-rift succession is pre-dominantly characterized by inverted structures associated with shortening owing to episodic inversion tectonic activity which had mostly occurred within the Late Cretaceous. Kinematics of the pre-existing major normal faults reveals that the major faults had endured four phases of compressional-extensional movements resulting in the inversion style being depicted as moderate inversion. Reactivation of the pre-existing major normal faults had a major impact on the geometry of the fault-related folds. Due to episodic and non-uniform compressional and extensional motion, the folded structures within the syn-rift succession were asymmetric in geometry and had played a major role in accommodating the compressional stress emanating from the fault displacement as the effect of shortening was relatively minimal. The authors would like to express their gratitude to the staff members of the Jilin oilfield branch of PetroChina Co. Ltd for their support in providing the geological and seismic data. The project was funded by the Key Laboratory of Technologies of Oil and Gas Resources. Project Number. No. 2017ZX05032-002. The authors would also like to extend their gratitude to the School of Geosciences, Yangtze University and the Ministry of Education for their support.